No sooner had the 2013 Atlantic Hurricane Season been declared “officially” opened, than a meandering tropical wave over the northwestern Caribbean started to get stronger and more organized, affecting the Cayman Islands, Cuba, Belize, vast portions of Central America and the Yucatan Peninsula with stormy weather and heavy rains, as it moved slowly northward toward the Gulf of Mexico. 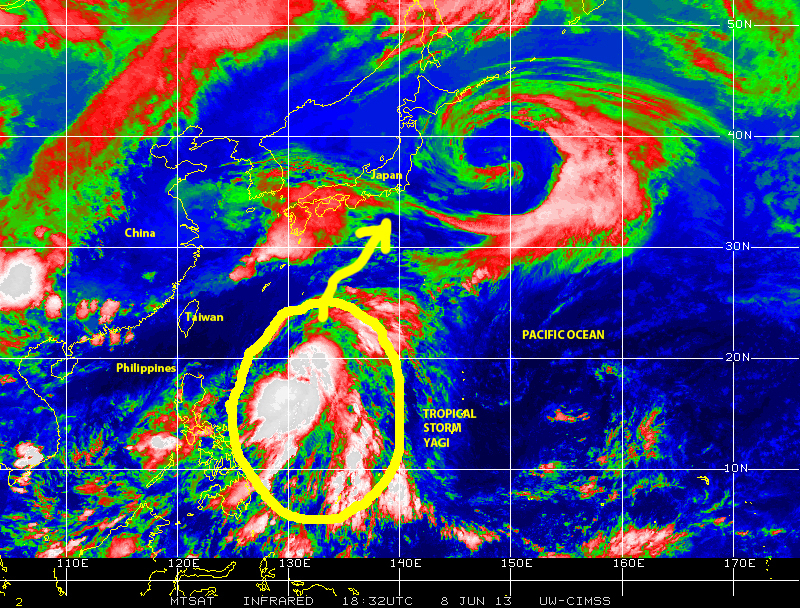 By June 3, satellite images were already showing some storms bands starting to coalesce around a center of low pressure while the system continued to move northward at a rather deliberate pace of about 5 – 6 kph. The storm entered the Gulf of Mexico continuing its northward track paralleling the west coast of Florida some 200 -250 kilometers offshore, and already generating copious rain over most of the peninsula. Flooding started to occur and tornado warnings were issued for several areas in Florida. By Wednesday, June 5, hurricane hunter airplane observations had detected a center of circulation and sustained surface wind speed of 64 kph. (40 mph), we had a tropical cyclone in the Gulf, the first named-storm of the 2013 Atlantic Hurricane season: tropical storm ANDREA! Tropical storm ANDREA as it moved off the gulf coast of Florida on June 5, 2013. Tropical storm ANDREA strengthened during the night and continued to do so on Thursday, June 6, reaching maximum sustained winds of 96 kph (60 mph), started to track faster while beginning a gradual turn first to the NNE and then NE toward the big bend region of the Florida coastline. As rain and wind intensified, and storm bands pounded most of Florida the National Weather Service (NWS) issued a state-wide tornado watch reaching from the tip of South Florida to the Georgia border. Tornado watch issued by the NWS on June 5, 2013 as tropical storm ANDREA, the first named storm of the 2013 Atlantic hurricane season, moved over the Gulf toward landfall in the Big Bend area of the Florida coastline. In my home-base in Southeast Florida rain and thunderstorms became more frequent and continued during the night and into Friday, June 7, in the morning. The NWS issued a flash flood warning through 9:30 a.m. for extreme northeast Miami-Dade County and neighboring coastal region in Broward County. By this time tropical storm ANDREA had crossed over Florida and over the coastal region of Georgia and South Carolina where propelled by a dipping jet stream and other atmospheric features it regained some strength, after having decayed overland Florida, and began to move toward the northeast paralleling the Atlantic coast line at speeds of 40 kph (25 mph) and even faster. While tropical storm ANDREA continued its progress along the Atlantic seaboard, its parting gift for southeast Florida during the afternoon on Friday, June 7, was an increase in rainfall, which began to fall at the rate of more than one inch an hour, causing the flash flood watch to be extended initially until 5:45 p.m., and then until 11:45 p.m. as more and more rain fell. Severe flooding occurred in North Miami Beach, Aventura, Hallandale, Hallandale Beach, Hollywood, Fort Lauderdale and neighboring areas. By 11:00 p.m. more than 356 mm (14″) of rain had already accumulated in North Miami Beach. Thousands of people and vehicles were stranded or suffered damage because of the extensive flooding. Reports from communities in the coastal regions of the Carolinas, Virginia, Delaware and beyond, in New Jersey and New York, indicated numerous instances of flash flooding as the storm continued to accelerate toward the northeast. Observing the havoc caused by tropical storm ANDREA’s parting shot over southeast Florida, even as it was causing severe impact in other far away regions of the USA, it was difficult not to wonder what could have happened if the same or perhaps an even larger amount of extreme rain had been produced by a large wet hurricane approaching the coastline slowly over the Atlantic, generating wide-ranging storm surge and wave action in this region. For starters, the rain event on Friday, June 7, illustrated how ineffective our water management system already is in dealing with extreme rain and an already saturated soil. It is clear that as the level; of the sea has continued to rise, the draining capacity of the water management system, which is largely dependent on gravity flow, has already diminished and will continue to diminish in the future. Tropical storm ANDREA, just as hurricane SANDY did in 2012, demonstrated that the combination of a large wet tropical cyclone, generating extreme amounts of precipitation, and storm surge and wave action, can result in vast amounts of damage to the built environment along the coastal region. No major hurricane is really needed to generate really a lot of damage from the impacts of extreme rain, rising and rushing water, plus wave action. However, should a major hurricane with such wet and storm surge characteristics be in the mix, wind and flying debris damage will then add to the impact. Were SANDY in 2012, and now ANDREA in 2013, typical of what we might see more of in the future? Was this a taste of things to come? Are we prepared for such impacts or even worse ones? Relative to at least one of these questions, I would argue that empirical data alone show our coastal region is not prepared for these or worse kinds of impacts that may combine extreme rain, flash flooding, storm surge and wave action. Trillions of dollars in built environment, and all of the components of human activity, as well as critically needed infrastructure, including essential water systems and waste-water treatment facilities located near the coast are at risk of suffering potentially catastrophic damage from recurring storm impacts. So what is happening today, Saturday June 8, 2013? Where did ANDREA go? What is happening elsewhere in the tropics? 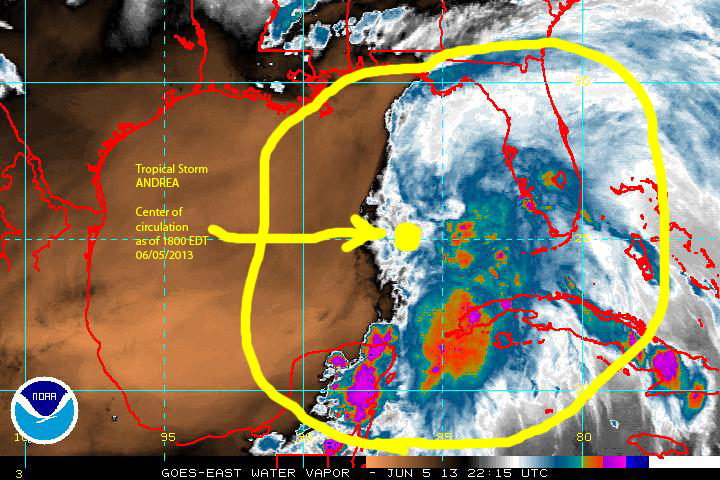 In the larger Atlantic basin, ANDREA has been pushed out of the region by the jet stream. Another area of disturbed weather has mover over the Gulf of Mexico generating vast amounts of rain over several areas in Florida. Tropical waves generated over Equatorial Africa continue to move westward over the warm waters of the Atlantic where hurricane alley is populated by several large cells of storms and disturbed weather all the way across to the coastline of the Lesser Antilles and South America. The satellite image below illustrates these tropical activities in the Atlantic. 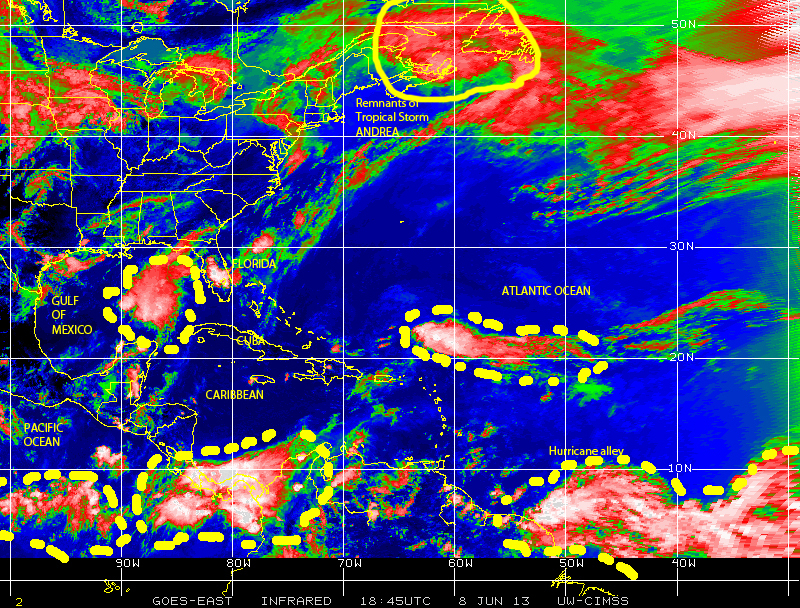 GOES satellite image on June 8, 2013 showing various regions of disturbed weather in the Atlantic basin. Elsewhere, at the other side of the world over the northwestern Pacific ocean just to the east of the Philippines tropical storm YAGI, quite large and strong, has generated and is moving NNE toward Japan while generating quite intense rain mainly over open ocean waters. Color-enhanced infrared satellite image of June 8, 2013 showing Tropical Storm YAGI to the east of the Philippines as it moves NNE in the general direction of southern Japan. As summer approaches the tropics in the northern hemisphere are already seeing plenty of disturbed weather and potentially cyclonic activity. We all need to pay attention and be prepared. Above all, we must practice MITIGATION!